Is the word ‘literacy’ useful? Literacy is a state which has traditionally been ascribed (or not) to individuals. Is the state that writers on ‘New Literacies’ espouse simply a case of encoding and decoding texts? It would appear from the above, given the references to ‘identity’ and ‘community’ that perhaps we have moved beyond literacy. An idea to be explored in what follows is that a digital version of the concept of Flow may be a Pragmatically-useful concept to use in place of the seemingly never-ending ‘umbrella terms’ outlined earlier. Focusing on the term ‘literacy’ and attempting to shoehorn 21st-century behaviours, technologies and attitudes into the concept could lead to anachronism. Literacy, as we have seen, is predicated upon technologies used to encode and decode texts. The reason Traditional Literacy was such a stable concept with a definite meaning in the minds of most people was due to it built upon a technology that did not change significantly in hundreds of years. It is the pace of innovation in new technologies that has caused a problem for conceptions of literacy. 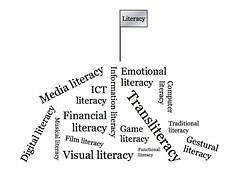 If instead of a ‘top-down’ approach to literacy (‘x, y and z consitute literate activities’) a ‘bottom-up’ approach was considered this could potentially side-step the difficulty caused by the pace of technological change. The reason that concepts such as ‘digital literacy’, ‘cyberliteracy’, ‘new literacies’ and the like have been proposed is to give a name to a socially useful state to which individuals can aspire. 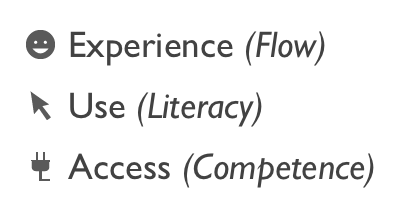 Given that most proponents of such terms would agree that their thinking is built upon Traditional Literacy, it would seem that using ‘literacy’ as an epithet for these extra skills, abilities and behaviours is unnecessary. Mass education – as developed in the 19th century – served to instil a minimum standard through drill-and-practice within the realm of Traditional Literacy. Some have likened this to a factory model with Taylorism as its guiding principles. This is slightly unfair, given the constraints, social problems and political landscape of the time, but does throw light upon how debates surrounding the purpose of education have shifted. It is no longer enough to ensure that young people leave school with the ‘3Rs’. Indeed, under initiatives such as Ofsted’s Every Child Matters (ECM), wider concerns such as children’s (mental) health, and their ability to achieve ‘economic wellbeing’ have necessarily been brought to the forefront of planning and curriculum design in UK schools. Instead of having to continually widen and redefine literacy to cater for new technologies and methods of social interaction, a focus on Digital Flow would be consistent with the idea of ‘liquid modernity’. It would serve to end the idea of a ‘life-project’ being something external to the individual and encourage individuals to embrace short-term, pragmatic strategies when approaching digital technologies (Martin, 2008:153). Digital Flow is focused on the creative act, as opposed to never-ending definitions of literacy predicated on the consumption of media or physical goods. As a result, Digital Flow can be considered the ‘umbrella-term’ for which theorists have been grasping and over which they have been arguing. Moreover, it can be seen as a coherent target at which to aim educational experiences. Is Twitter bad for you? I have to confess that, at first, I couldn’t see the point of Twitter. Since then, however, I’ve become somewhat of a convert, getting in touch with many people I wouldn’t have otherwise. I’ve avoided Twitter because I don’t want to be *that* connected. I know that it might be “useful” on some level, but so would joining clubs, taking classes, reading great books, working for non-profit civic organizations, and spending time with family. Everyone should set their own priorities, and define some limits. Nearly one million people use Twitter. That is almost negligible for a US website but guess how many people work in IT in California? Nearly a million. So how many “normal” people do you think use Twitter? When was the last time anyone normal (i.e. not people who get paid to look at these things) did anything (that did not involved a dancing seal or laughing baby) as a result of Twitter or Digg or Second Life – or even to a slightly lesser extent Facebook or FriendFeed or MySpace? The idea behind Kathy’s worries about the use of Twitter stems from a book by the wonderfully unpronounceable Mihaly Csikszentmihalyi entitled Flow. It’s a book I’ve been threatening to read for around 5 years now! 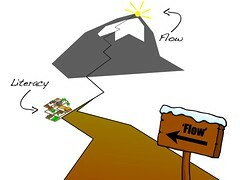 The state of ‘flow’ is, unsurprisingly, a highly productive state in which an individual is ‘in the zone’. Kathy argues that this is almost impossible when you’ve got constant interruptions and distractions. Twitter’s certainly one for putting you off the task in hand. So what I’ve begun to do, following the example of someone I read recently (but have now forgotten where) is to have two modes of working. The first is best described as outwards-facing, the second inwards-facing. When I’m in the former mode, I’m available on Skype, Twitterific automatically refreshes my friends’ tweets every 3 minutes, and I’m available on Google Talk via GMail. I’m using all four of my virtual desktops via OSX Leopard’s ‘Spaces’ feature and I’m moving around flitting from this to that. Effectively, I’m in ‘networked’ mode. What do you think? Is Twitter a bad thing? How do you use it?